I also see a fine line between this form of self-understanding and also gently pushing yourself to be a better person. If all I really want to do is feel sorry for myself and hide under the covers I might actually be shooting myself in the foot. Closing myself off to opportunities that may enrich me and make me feel more alive. It came in response to a travel series that I had been writing for my newsletter about my West Coast trip, spending the night in a yurt, and learning how to love what I love after a night in an airstream in Eugene. The summation of those emails was the concept that the absolute best life that we can build for ourselves has to be a life with ample space for us to move around in – including who we are, what we love, and our peculiarities and predilections. But after receiving this message, I realized that this concept required a bit of clarification. There is a big difference between being sweet to yourself and feeling sorry for yourself or hiding under the covers until the end of time. Humans flourish in warm and gentle climates – in environments where the conditions are carefully cultivated to suit our natures. You will flourish when you actively cultivate those kinds of conditions within your internal landscape and immediate surroundings. When you take yourself into account while making your plans and play to your strengths when writing your to-do lists. This does not mean taking it unduly easy on ourselves or living lives without ambition. Instead, it is about working with ourselves instead of against ourselves in order to get from here to there. It is about knowing that we do not need to feel the fear and do it anyway in order to feel alive. Fear is does not have to be your go-to motivator. Your life does not need to be a regime of one where you are both the ruler and the struggling citizen. Your life will not fall apart if you lead with love. However, there are times when we will feel fear and know that it is simply an emotion and not an indicator that we are on the wrong path or that we are doing something wrong. The slight difference comes from the trust in the relationship that we have built with ourselves. The difference is in telling ourselves the truth when it comes to what we desire. At the core of it all, I will follow myself anywhere, because I know, in my heart and in my bones, that I will never abandon myself again. I know that I will take care of myself – no matter what – and that I can trust in my own ability to follow my desires and take action on the things that I am craving. I know that I will do that because honoring myself and to prioritizing my dreams feels so good to do. I know this because I tell myself the truth about my life. I talk candidly with myself about my dreams. About the actions that I’m ready to take and the patterns that I tend to fall into when I’m at my edge. I talk to myself about what I’m afraid of and how I’m feeling. Internally I shed light on the chasm between my ambitious mind and my frequent desire to hop into bed and pull the covers over my head to meet my need for safety. We have to trust in our ability to honestly communicate with ourselves about the life that we are building. We can no longer carry a collective misconception that we will crumble to nothing when we stop whipping ourselves along, forcing ourselves to motivate and perform, or tapping into our willpower. We can no longer tell ourselves that if we stop beating ourselves up or speaking to ourselves harshly, we will never move forward, we will never get from here to there. We need reminding that there is a really big difference between living our lives to the brim and pushing ourselves to live in someone else’s vision of what a good life is. My life, my dreams and my ambitions are possible when they are grounded in the reality of who I am. When they are cultivated in love and acceptance of all of my parts. Your inner knowledge – your needs, your gut instinct, the full canon of your desires – is trustworthy. You can speak plainly to yourself. It doesn’t have to be complicated or precious. Tell yourself the truth and let your spirit shine through your actions. Allow yourself to be led by the things that light you up. 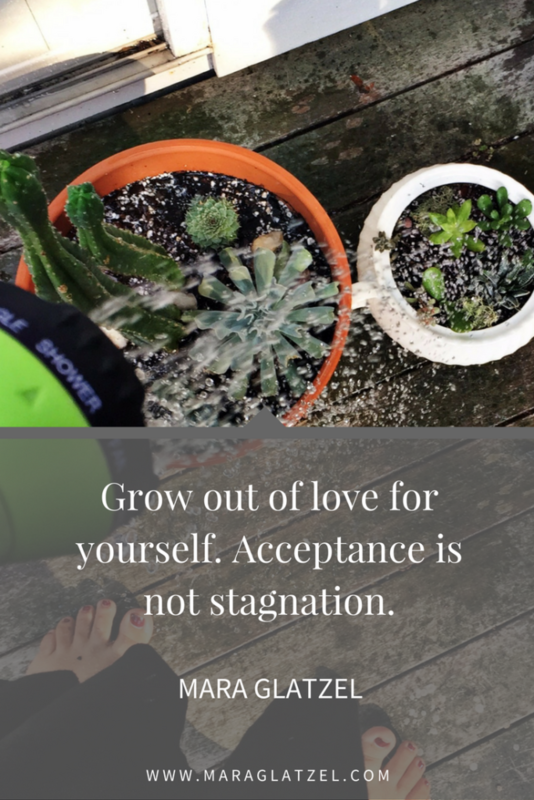 Do not mistake acceptance for stagnation. Yes! I’ve had an epiphany recently. I used to think that the options were relentless work or self-indulgence. If I wanted to be kind to myself, I stopped the hard work, and indulged myself. Then–lightbulb!–I realized that what I wanted to do was to *nurture* myself. I don’t want to indulge myself, I want to nurture myself. Nurturing myself has the best parts of work and the best parts of indulgence. I am a nurturer by nature, but it’s only recently that I’ve turned my nurture inward. I often start my day by thinking about how I can best take care of “4:00 Eliza.” What can I do that will set me up for a wonderful, stress-free evening? [Side note: I discovered this when I felt myself coming down with a cold–I took care of my future self by getting everything clean and tidy, and making a big batch of soup!] I can take care of some business, do some chores, perhaps exercise, eat nurturing food, and get the busy-work out of the way, so I can enjoy a relaxing evening with my husband. I’m telling you–it’s been life-changing!